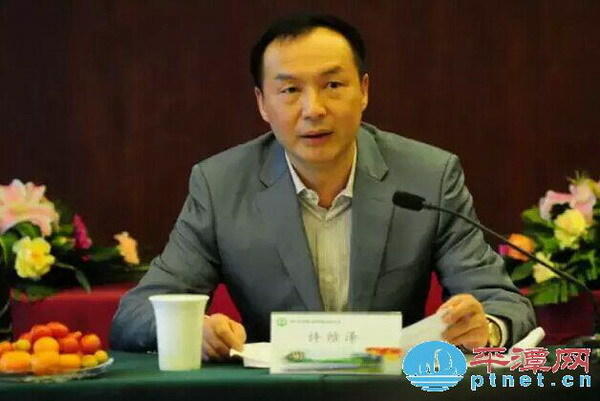 The Pingtan Comprehensive Pilot Zone (PCPZ) in Fujian province has a new leader, after Xu Weize was appointed director of the PCPZ’s administrative committee on July 2, local news portal ptnet.cn reported. The appointment was announced by Yang Guohao, deputy head of the Fujian Provincial Party Organization Department at a meeting in Pingtan on Thursday. Xu, 54, succeeds Li Dejin in the post. He is now also a member and vice secretary of PCPZ’s working committee. A native of Nan’an county, Xu previously worked as executive vice mayor of Nanping city. Xu Weize was born in Nan’an county, Quanzhou city in Fujian in December 1961. He has a Bachelor’s degree at the Party School of the Central Committee of the Communist Party of China(CPC). He began working in Aug 1982 and has worked as Vice Secretary of the Nan’an committee of the Chinese Communist Youth League, Deputy Party Secretary and head of Dongtian Township, and Party Secretary and head of Guanqiao Town. He took classes at the local Party School from Sept 1989 to July 1991 while working in Dongtian. He was appointed deputy Secretary and deputy Director of the CPC Working Committee of the Xiaocuo zone in Quanzhou city in April, 1996. He studied Party and government administration at the Correspondence Institute of the Party School of the Central Committee of the CPC from Sept 1997 to Dec 1999. Xu was named deputy Party Secretary and deputy Political and Legal Secretary of Quangang District of Quanzhou city in Dec, 2000. He was appointed deputy Party Secretary of the Party committee in Fengze district of Quanzhou city and the district’s acting chief in Sept, 2001, and promoted to district chief in Jan 2002. He was appointed Party Secretary of Fengze district in Oct 2005. He worked as Party Secretary of Shishi city from May 2010 to June 2011. He was appointed to the Party committee in Nanping city, the executive vice mayor of the Nanping government and Deputy Secretary of the Party Members’ Group in Nanping in Aug 2011. He was appointed director of the administrative committee of the Pingtan Comprehensive Pilot Zone in Fujian province on July 2, 2015.